・This page is prepared for medias to obtain all press release materials related to “A printable, flexible, lightweight temperature sensor ". ・Please strictly restrain from reporting on this context until the embargo is lifted at November 9, 2015 at 3:00 PM U.S. Eastern time. ・Please send a copy of the article to Someya (contact address: someya@ee.t.u-tokyo.ac.jp) when it is released. 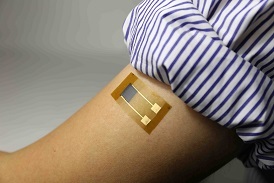 132KB 37KB IMAGE: Flexible temperature sensor sheet for large-area temperature mapping directly from skin or from biological tissue.